What is the difference between layering and spoofing? “Spoofing” and “layering” are both forms of market manipulation whereby a trader uses visible non-bona fide orders to deceive other traders as to the true levels of supply or demand in the market. Some regulators use the terms “spoofing” and “layering” interchangeably, while others, including FINRA, use “layering” to describe entering multiple non-bona fide orders at multiple price tiers, and “spoofing” to describe entering one or more non-bona fide orders at the top of the order book only. 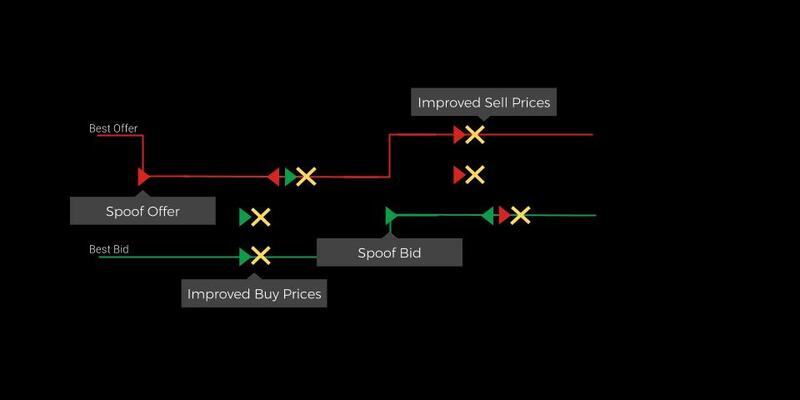 In spoofing patterns, a trader enters a single visible order, or a series of visible orders, that either creates a new best bid or offer or adds significantly to the liquidity displayed at the existing best bid or offer. During the lifespan of that first order(s), or within a short time after it is cancelled, the same trader executes a trade on the opposite side of the market. The pattern is manipulative because the execution occurs at a more favorable price than the trader was likely to obtain in the absence of the first order(s). This is true regardless of whether the buy (sell) execution occurs at the pre-sequence best bid (offer) price, at the midpoint, or at the new best offer (bid) price set by the spoof order. In any of those scenarios, the trader is executed at price better than if he had hit the pre-spoof bid or had taken the pre-spoof offer. Layering is a variant of spoofing where the trader enters multiple visible orders on one side of the market at multiple price tiers, which cause the midpoint of the spread to move away from those multiple orders, and the same trader executes a trade on the opposite side of the market. Again, the pattern is manipulative because the execution occurs at a more favorable price than the trader was likely to obtain in the absence of the first orders. 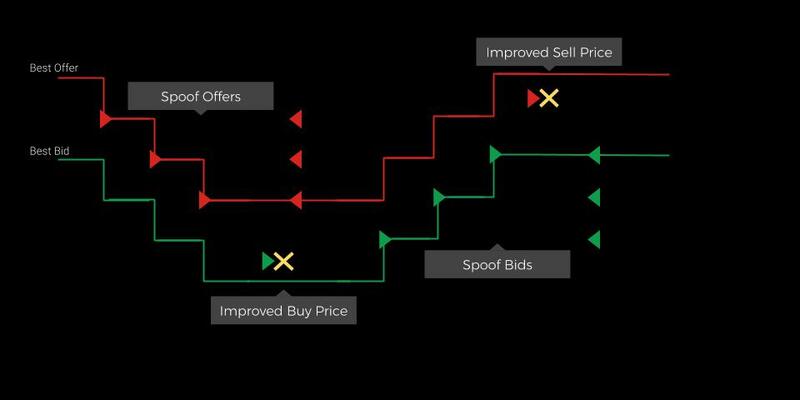 If the trader enters orders at multiple price tiers that successively set the new best bid or offer as they are entered and remain live after the newer orders are entered, as in the figure above, the same pattern could be described either as spoofing or layering. For more on the differences of layering versus spoofing, you can learn more about spoofing here, and learn more about layering here.